Slide Mountain: On May 31, 1997, an intrepid group of hikers from Troop 132 conquered Slide Mountain in the Catskill Mountains of New York. 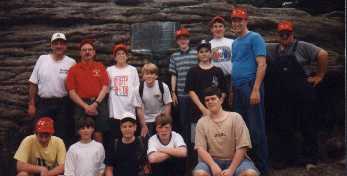 In the summer of 1998, several scouts and scouters from Troop 132 traveled to Philmont Scout Ranch in Cimarron, NM to participate in a ten day backpacking trek. Every spring, the troop hikes along the Gravity Railroad bed to the cliffs over route 435 in Elmhurst. One feature of this annual hike is raising a new flag on the flagpole on the cliffs.